New York, New York is a 1977 American musical drama film directed by Martin Scorsese and written by Mardik Martin and Earl Mac Rauch based on a story by Rauch. It is a musical tribute, featuring new songs by John Kander and Fred Ebb as well as jazz standards, to Scorsese's home town of New York City, and stars Robert De Niro and Liza Minnelli as a pair of musicians and lovers. 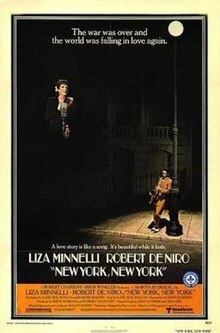 The story is "about a jazz saxophonist (De Niro) and a pop singer (Minnelli) who fall madly in love and marry"; however, the "saxophonist's outrageously volatile personality places a continual strain on their relationship, and after they have a baby, their marriage crumbles", even as their careers develop on separate paths. The film marked the final screen appearance of actor Jack Haley. The story opens on V-J Day in 1945. A massive celebration in a New York City nightclub is underway, music provided by the Tommy Dorsey Orchestra. While there, selfish and smooth-talking saxophone player Jimmy Doyle (De Niro) meets small-time USO singer Francine Evans (Minnelli), who, although lonely, still wants nothing to do with Jimmy, who keeps pestering her for her phone number. The next morning, they end up sharing a cab, and, against her will, Francine accompanies Jimmy to an audition. There he gets into an argument with the club owner. Francine, to get the audition back on track, begins to sing the old standard, "You Brought a New Kind of Love to Me"; Jimmy joins in on his sax. The club owner is impressed and, to Francine's astonishment, they are both offered a job—as a boy-girl act. From that moment on, Jimmy and Francine's relationship deepens into a mix of obsession and love. But there are problems—mainly, Jimmy's tendency to fight with his co-workers, and his increasingly violent arguments with Francine, who becomes pregnant with his child. An especially bad shouting match between them results in Francine going into labor. Jimmy rushes her to the hospital, where she delivers a baby boy. But Jimmy is not ready to be a father, or a good husband, and he abandons his wife, declining even to see his newborn son as he leaves the hospital. Several years later, in a recording studio, Francine records "But the World Goes Round", a powerful anthem which makes the charts and turns her into a popular entertainment figure. In the years that follow, Jimmy and Francine both find success in the music industry; he becomes a renowned jazz musician and club owner, while she becomes a successful singer and film actress. Jimmy records a song of his on his saxophone which tops the jazz charts, and Francine cements her stardom after singing that same song, "New York, New York", for which she has provided the lyrics. Her performance, received by a wildly appreciative audience, takes place in the same nightclub where, years earlier, she and Jimmy had met. After the show, Jimmy telephones his ex-wife, suggesting they get together for dinner. Francine is tempted, heads toward the stage door exit, but at the last moment changes her mind. Jimmy, waiting on the sidewalk, realizes he has been stood up and heads off down the street, accompanied by the song he has written—the "Theme from New York, New York". Adam David Winkler as Jimmy Doyle, Jr. The theme song of the film, "Theme from New York, New York", found its own success when Frank Sinatra recorded a cover version of it in 1980. The song became a hit, and both Sinatra's and Minnelli's versions have become closely associated with Manhattan in New York City. Minnelli continues to perform the number at nearly all of her concerts. Made after Scorsese's successful Taxi Driver, the film was a box-office failure. Its budget was $14 million, a large figure at the time, and it grossed only $16.4 million at the box office. The disappointing reception drove Scorsese into depression and drugs. However, it is reported in Peter Biskind's book Easy Riders, Raging Bulls that Scorsese's addiction to cocaine and complete lack of control over the improvisation of dialogue on the set were major factors that contributed to the failure of the film. United Artists ultimately recouped its loss on the film as a result of an agreement wherein they would share the profits with Rocky, which the executives had expected to be a flop. In his introduction to the film's DVD, released in 2005, Scorsese explains that he intended the film as a break from the gritty realism for which he had become famous, and sees it as an homage to the musical films of Classical Hollywood. For this reason, he designed the film's sets and storyline to be deliberately artificial-looking. He acknowledges that it is an experiment that did not please everyone. The film currently holds a 59% 'Rotten' rating on Rotten Tomatoes, based on 32 reviews. TIME reviewer Christopher Porterfield stated that "If this movie were a big-band arrangement, it would be a duet for a sax man and a girl singer, but with the soloists in a different key from the band." Critic Dave Kehr from the Chicago Reader wrote that "Scorsese created a very handsome and dynamic film, but the spectacular set pieces don't add up to much." Variety's uncredited reviewer stated that in "a final burst from Old Hollywood, Minnelli tears into the title song and it's a wowser." Reviewer Geoff Andrew from Time Out states that "Scorsese's tribute/parody/critique of the MGM musical is a razor-sharp dissection of the conventions of both meeting-cute romances and rags-to-riches biopics." Reviewer Vincent Canby from The New York Times questioned, "Why should a man of Mr. Scorsese's talent be giving us what amounts to no more than a film buff's essay on a pop-film form that was never, at any point in film history, of the first freshness?" Critic Roger Ebert from the Chicago Sun-Times writes that "Scorsese's New York, New York never pulls itself together into a coherent whole, but if we forgive the movie its confusions we're left with a good time." When the film was originally released, it had a running time of 155 minutes. The box-office failure of the film prompted United Artists to cut the film down to 136 minutes. It was then re-released in 1981 with the deleted scenes restored, including the lengthy musical number "Happy Endings", only a small portion of which had appeared in the original release. The total running time of the DVD edition is 163 minutes. ^ "New York, New York (A)". British Board of Film Classification. July 21, 1977. Retrieved June 26, 2014. ^ "New York, New York (1977)". Box Office Mojo. Retrieved December 19, 2016. ^ Nashawaty, Chris (February 19, 2002). "EW: The Right Hook: How Rocky Nabbed Best Picture". Entertainment Weekly. This page was last edited on 21 March 2019, at 15:40 (UTC).